I am a dedicated Personal Trainer from New Zealand, whose objective is to help my clients achieve their health and fitness goals. With the experience gained from my sporting and professional backgrounds and love of fitness, I have helped many people of various ages achieve a well-balanced lifestyle. 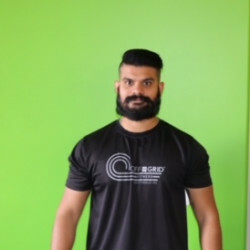 I come from a heavy sporting background, having represented my state in rugby and field hockey, and New Zealand for martial arts and cricket at age group levels. University was a big time in my life as I gained a lot of weight (went from 160lbs to 240lbs in two years). Within the next year I was down to 160lb. It took a lot of sweat, cursing and dedication but I did it! And so can you! I believe in a holistic approach to training taking nutritional, physical, social, mental and emotional factors into account. Throughout my time as a trainer, I have helped family, friends and clients with fat loss, gain strength and power, increase mobility and flexibility, as well as passing on the nutritional knowledge required to lead a well - balanced lifestyle. While I personally train in the strength, power lifting and body weight movement modality, I use all the knowledge I have gained in other training forms to tailor programs and sessions specifically to my clients’ needs. Sessions are designed to be challenging, engaging, educational but above all else fun. If you thoroughly enjoy the training program you are on, you are twice as likely to attain you results faster. • Liberating human movement through body weight exercises.ZUU is the world’s most respected educator in Human Movement. ZUU is a registered body weight training modality created by Nathan Helberg that started in elite sports and armed forces. Over the years ZUU has become an integral part of these sectors being used for pre-season training, game specific conditioning, rehabilitation, confined space training, remote location training and front line troop training where equipment is unavailable or inaccessible.